The best performing currency this past week was the Canadian dollar which shot higher on the back of hawkish comments from the central bank. Senior Deputy Governor Carolyn Wilkins questioned the need for less stimulus, sparking talk of a rate hike for the first time in 7 years. 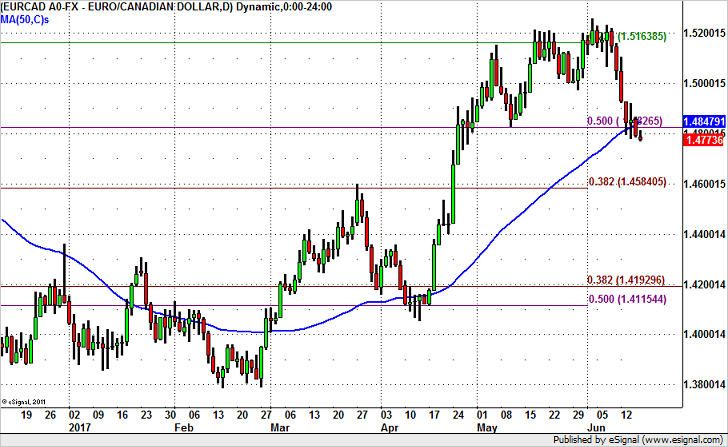 With oil prices also rising, we expect further gains in CAD. In particular, we think the loonie will outperform the euro not only because 1.13 is a significant resistance level but also because next week’s Eurozone PMI reports are expected to be softer. Technically as long as EURCAD holds below 1.4850, there’s no major support in EUR/CAD until 1.4600.